The expansion of Terminal 1 repositions South India’s busiest airport as an important hub for international travelers and cargo. With a design that creates a pleasant and efficient curbside-to-aircraft passenger experience, the open, welcoming environment is easy to navigate and accommodates the increasing number of passengers using the airport. 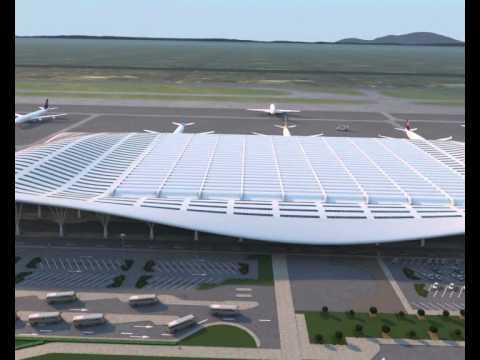 The structure creates a grand, dramatic presence that seamlessly blends with the existing terminal. An elegantly curved roof serves as the unifying element for the new and existing facilities, creating a strong physical presence and visual identity for the airport. The roof’s undulating shape forms a canopy that protects passengers and visitors from the elements. Its structural system includes a monolithic plinth with elegant steel branches that pass through a suspended ceiling to meet the structure above. Along with the building’s large overhang, the use of low-e glazing reduces unwanted heat gain to create an energy-efficient, high-performance structure. Skylights enable natural light to penetrate from above, linking the atmosphere and spacious feeling of the original building with the expansion. At the east and west ends of the terminal, 65-foot-high glass walls flood the space with natural light while creating commanding views to the outside. Silver metallic and bright white finishes recall the high-tech nature of the city. Interior landscape features and plantings reinforce Bengaluru’s reputation as India’s “Garden City.” New passenger amenities include enhanced seating areas at gate lounges and a variety of new retail and dining opportunities. Expanded, centralized departure areas include the addition of 30 check-in counters, six emigration counters and 11 security counters serving domestic and international passengers. The expansion adds international gates designed specifically for newer wide-bodied aircraft such as the Airbus A380, as well as a more efficient baggage delivery system with dedicated island carousels. 1.44 million sq. ft. / 134,000 sq. m.
Take a virtual tour of the new Kempegowda International Airport Terminal 1 in Bengaluru.